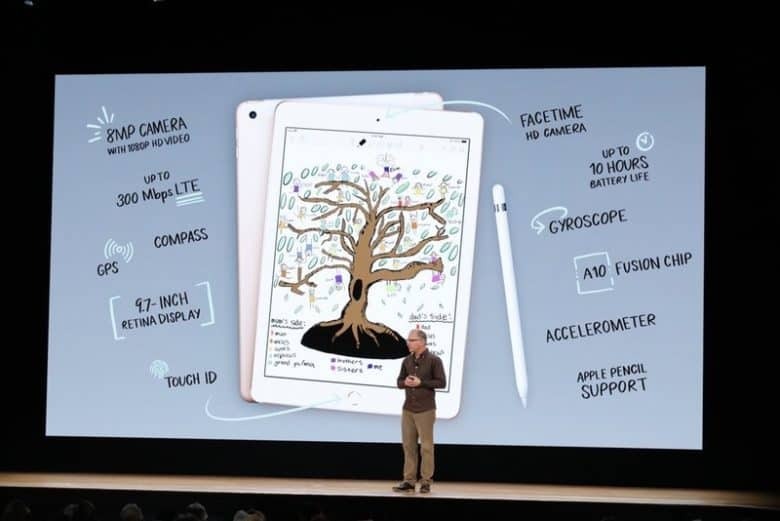 The iPad (2018) is aimed at students. Apple just unveiled a 9.7-inch iPad that will cost schools just $299. The debut came at today’s education-oriented event in Chicago because this tablet is designed for students, with Apple Pencil support and a faster processor. Tim Cook and crew did not unveil this tablet at a high school by accident. Apple is aiming the new iPad straight at classrooms and budget-conscious school districts. Support for Apple’s pressure-sensitive stylus is a big part of that. Apple Pencil supports means young children will be able to practice writing on the screen, as well as drawing and sketching. The company said this morning that three of the most popular iPad apps in education are Pages, Keynote and Numbers. The company promised that those apps will get updated with Apple Pencil support soon. That’s good news for teachers, as they’ll be able to use the new Smart Annotation feature to grade students’ work directly in Pages. 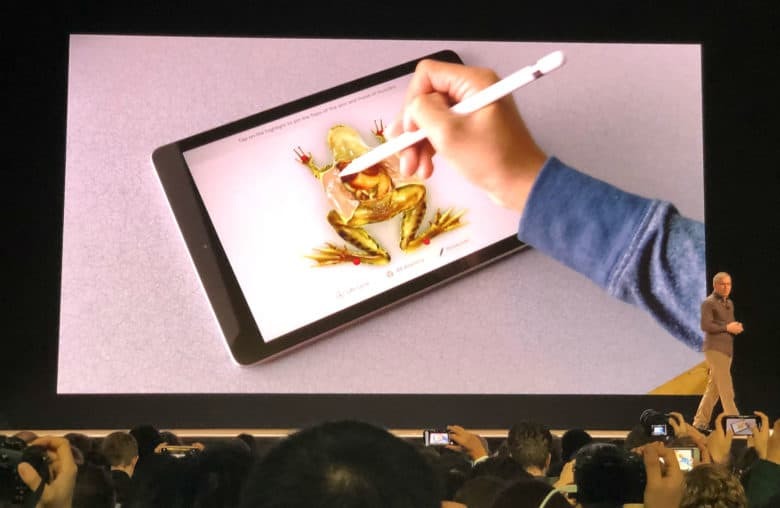 Or kids can virtually dissect a frog on the new iPad, using the Apple Pencil as a stand-in scalpel. Apple Pencil is good for more than just drawing. You can dissect a virtual frog with it! This stylus works only with screens designed specifically for it, which so far have been only high-end iPad Pro models. That makes today’s announcement a significant change in strategy. Unfortunately, the Apple Pencil does not come bundled with the new iPad. It’s a $99 optional add-on. This will make it harder for the iPad to compete with the first tablet running Chrome OS, which was announced yesterday and does come with an active pen. Still, schools that prefer iPads can opt for the new Logitech Crayon, a less-expensive stylus also shown off during Apple’s event today. For many years, all 9.7-inch iPads cost $499. Then Apple surprised everyone with last year’s $329 model. This helped the company turn around years of slowing tablet sales. Now, Cupertino set the entry-level bar even lower than that — while improving specs. That said, the $299 price is only available to schools. The general public still will pay $329. But buyers will get a vastly improved Apple tablet. 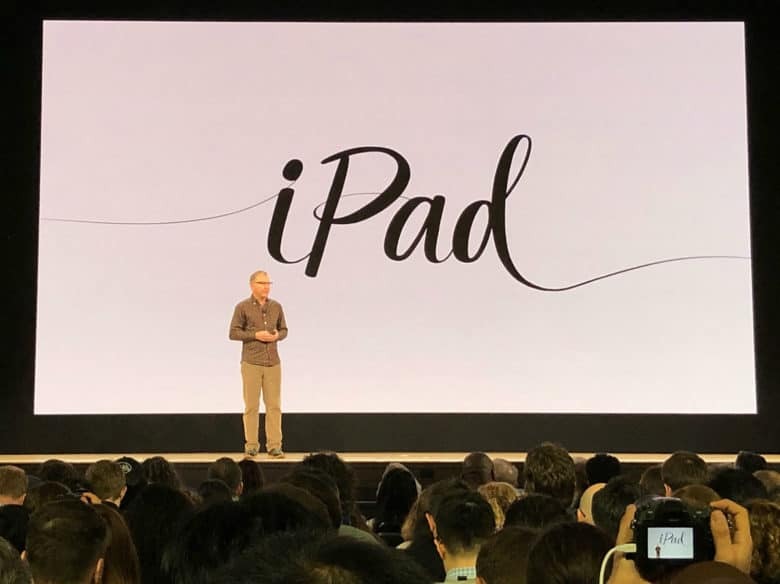 “The new 9.7-inch iPad takes everything people love about our most popular iPad and make it even better,” said Greg Joswiak, Apple’s vice president of worldwide iPod, iPhone and iOS product marketing, at today’s event. The new model includes a speedy Apple A10 Fusion processor, introduced in the iPhone 7 and 7 Plus. A lesser A9 chip powered last year’s iPad. The 2018 iPad’s display uses the 2048-by-1536 pixel resolution that Apple has built into all its 9.7-inch tablets for many years. This gives the screen a 261 PPI pixel density, leading to very crisp-looking text. Apple promises 10 hours of batttery life — long enough for this computer to run continuously for an entire school day. Other features of the new model include a front-facing HD camera and a rear-facing 8-megapixel camera. There’s Touch ID (Apple’s fingerprint scanner), plus GPS, a compass and a gyroscope. For an additional $130, shoppers can add 4G LTE support for ubiquitous access to the internet. Of course, there’s Wi-Fi for the classroom or living room. The 9.7-inch iPad 2018 starts shipping later this week. (You can pre-order one now.) The $299/$329 version comes with 32GB of storage. Taking it up to 128GB increases the price to $429. Apple VP Greg Joswiak gets ready to take the lid off the new iPad at Apple’s education event in Chicago on May 27, 2018. Apple once dominated K-12 education, but now finds itself struggling to remain relevant. During the first quarter of this school year, 60 percent of all computers installed in classrooms ran Chrome OS, Google’s cut-rate operating system for PCs. Apple did not even come in second: That honor goes to Microsoft, with 22 percent of the market. Apple came in third at 17 percent, according to Futuresource Consulting. A low-cost iPad is just part of Apple’s drive to regain its role in the classroom. The company made several other announcements at its education-themed event in Chicago, including a Schoolwork app for teachers, iWork upgrades and more.